Need somewhere to rest your weary head before or after your flight? Luckily, there are 3 hotels within close proximity of Newcastle Airport, all are less than half a mile from the terminal. The great thing is, is there’s a hotel to suit all budgets too; if you’re looking for something a bit more luxurious than a standard hotel, try DoubleTree by Hilton or if you’re working on a budget, then the Premier Inn might be the best option for you; their rooms are great value for money but offer great comfort, too. Below are the three closest picks for you. Simply click the ‘more info’ button to find out what the hotel offers, including what you’ll find in the room and what facilities you can enjoy. The Premier Inn is directly opposite the terminal building at just a 200 metre walk away. 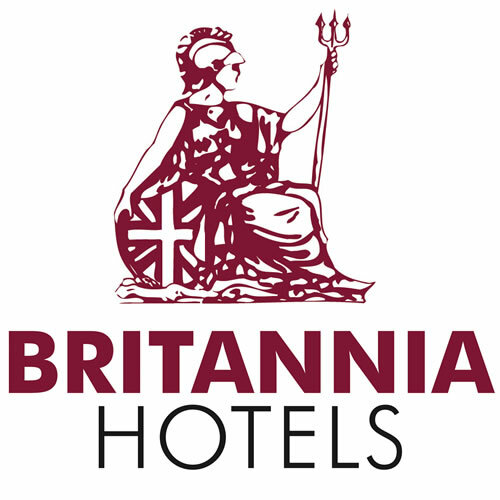 Stay at The Britannia Hotel and take advantage of their park and fly packages and conference facilities! The Double Tree by Hilton Hotel is the perfect place for a bit of luxury. Relax in front of your 37″ TV, dine in the delicious Italian restaurant and work up a sweat in the complimentary fitness suite. You’ll even be treated to a complimentary cookie upon arrival, too! Enjoy dinner at the delectable Fratello’s Restaurant, grab a drink form Columbus Bar or simply order room service if you’d prefer dinner in front of the TV! As well as the pillow choice and black out curtains we mentioned earlier, you’ll also have a TV with over 80 Freeview channels, a power shower, tea and coffee and the all important free WiFi and desk space. Yes! Breakfast is served at the ‘Thyme’ restaurant from 6:30am-10:30am and then it reopens at 6pm for dinner until 10pm. Breakfast wise, you can enjoy a continental spread for just £6.99 or upgrade to the Premier Inn Breakfast for £8.99, which includes everything from bacon and sausages to American pancakes. When it comes to dinner, you’ll have plenty of British classics to choose from. Conveniently located a short distance from the terminal doors, this hotel is a firm favourite with business travellers. With conference facilities and on-site parking, as well as it being a popular wedding venue, it’s not hard to see why! Enjoy breakfast, lunch and dinner in The Old Rangoon Restaurant. The all inclusive breakfast is from 6-9:30am Monday to Saturday and 7-10am on Sunday whilst their a la carte dinner menu is available between 6-9:30pm daily. Oh, and Happy Hour is from 4-7pm in the Bar!